Psalms 139:14(KJV); I will praise thee; for I am fearfully and wonderfully made: marvellous are thy works; and that my soul knoweth right well. God attaches great and immeasurable value to you. In the great art of creation, he took particular care when making you; you are fearfully and wonderfully made. You are a work of God. You are His masterpiece. You must have to carry this understanding in your inner most conviction. Let nothing on the outside convince you otherwise. 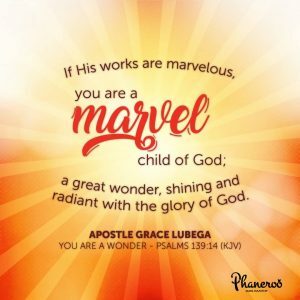 If His works are marvelous, you are a marvel child of God; a great wonder, shining and radiant with the glory of God. Kings come to your rising because you are a marvel. The Gentiles come to your light because you are a marvel. Creation bows before you because you are a marvel. Act like it! Speak like it! Live like it! PRAYER: Father, I thank you for this great Word. I am a wonder! What a blessed truth! I am your workmanship created in Christ Jesus unto good works. Like Christ went about doing good, I go about doing good because it is in my DNA. In Jesus’ name. Amen.